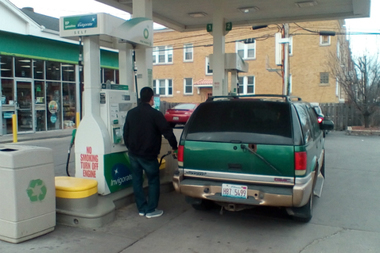 A driver takes advantage of gas under $2 a gallon for the first time in seven years at a BP gas station in the Logan Square neighborhood. CHICAGO — Chicago drivers are getting a pleasant surprise at the gas pump: gas under $2 per gallon, a price motorists haven’t seen in seven years. In the last week, the price at the pump has fallen 10 cents a gallon to an average $1.91 per gallon within city limits, according to AAA’s Fuel Gauge Report, a website that tracks gas prices locally and nationally. AAA said prices have been dropping dramatically for the last 30 days, saving Chicago motorists nearly 45 cents a gallon compared to last month and 65 cents a gallon from a year ago. While gas stations outside the city have been advertising prices well under the $2 threshold for months, averaging around $1.65 per gallon and as low as $1.35 in some places, it was way back in 2009 when Chicago drivers saw prices at this level. But prices have plunged even lower than they did in 2009. Mosher said that seven years ago, the price of gas in the city dipped below $2 only for a few short days before heading up again. At the BP gas station at California and Fullerton in Logan Square, employee Edgar Salgado said a lot more gas has been sold lately due to the low prices. Mosher said a steep drop in the cost of oil, combined with a high supply of gas and low demand have resulted in unusually low gas prices. She said the savings will impact both household budgets and the national economy. AAA has seen an increase in automobile travel as well that is at least partly tied to lower fuel costs, Mosher said. The savings from low gas prices wasn’t lost on Larry Greenwall, who drove his extended family of 11 from Port Huron, Mich., to Chicago to see his daughter graduate from U.S. Navy basic training this week. Greenwall pulled into the BP to fill up the 35-gallon gas tank on his Chevy Express 3500 van for the six-hour ride home. Another driver, Ian Hildebrand, liked the low prices, but wondered if they were ultimately a bad thing for the environment. “Low prices are good, but we need to find alternative fuel sources,” he said. Mosher said the only bump expected in prices will be sometime in April, when federal regulations require Chicago area gas stations to make the annual switch to a "summer blend" of gasoline, a formulation that decreases ozone emissions. But the changeover is expensive for petroleum refineries, so the switch in gas blend, which needs to be completed by May 1, will temporarily increase prices. Besides this blip in cost, it looks like low gas prices are going to be around awhile, Mosher said.